Mysterious Depths - An African Adventure by Mimizz Efemena Agwarota is a story set against an African backdrop. Mamuke finds herself discovering other things while taking care of her pregnant sister. She encounters a world of adventure and suspense. Her time with her sister takes her on a path of self-discovery. The book speaks about the African culture that existed in a bygone era. The book also speaks abut love. The African backdrop gives the story an element of mystery which makes the story even more exciting to readers. We get to know a lot about African culture, traditions, and the customs that they believed in and followed. An element of mystery runs throughout the story. Mamuke's meeting with Uwami is again another beautiful setting where the beauty of Africa is captured. The rich culture, traditions, and the religious rites followed by the African people are incorporated into the story, adding greater interest. Mamuke's journey is a thrilling adventure which takes you through the African tribes, culture, customs, and traditions and reveals a deeper insight into those. The author has woven the sub-plots into the main story masterfully. The other characters in the story are also powerfully portrayed to lend good support to the main characters and plot. The author's writing is vivid and the descriptions are so detailed that you can actually see the scenes unfolding in front of your eyes. The story is fast paced and there is never a dull moment till you put the book down. 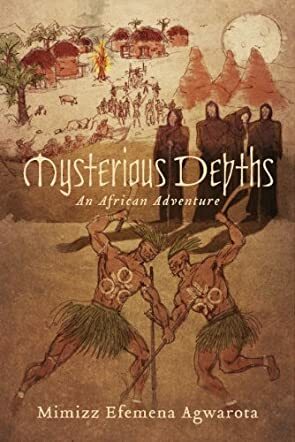 The book Mysterious Depths, An African Adventure, opens with two sisters Mamuke and the pregnant Sisim, being left all alone, devoid of any family. Author Mimizz Efemena Agwarota then builds up her story’s plot slowly, when Mamuke goes on an errand to get food that her pregnant sister craves. Little does she know that this act will set her on an arduous journey to her past. And how she faces her challenges will determine her family’s future. Born in mysterious circumstances, Mamuke has no memory of her parents. Lured into the arms of a prince, her courage and loyalty will be tested, as she is introduced into the mysterious African world of spirits, kings, evil spirits, and medicine men. Will Mamuke rise to these challenges, even if it becomes a matter of life and death? Mimizz Efemena Agwarota’s story, Mysterious Depths, is set in the mystical world of ancient Africa. She writes in beautiful prose and with vivid clarity so that it is easy to visualize her story. From the beginning, it is difficult not to feel sympathy for Mamuke and Sisim, the beautiful young sisters who seem to be very vulnerable to their precarious situation in life. This is a story of love, deception, and intrigue. It may sound common enough but then it is based on the culturally fertile world of ancient Africa, and this makes the story simply fascinating. Obviously, the author knows her subject very well. This is evident in the ease with which she is able to weave her story. Her characters are all well rounded so that in spite of the fact that some of the twists and turns are steeped in ancient African culture, any reader can still empathize with them. This book is absolutely an interesting read! The rituals of ancient Africa come rushing into the life of Mamuke as she is suddenly thrust into an adventure of mystery, one of which is the disappearance of her brother-in-law, Otobo, and intrigue which came roaring into her life like the charge of a lion and totally unexpectedly. In Mysterious Depths by Mimizz Efemena Agwarota, Mamuke starts out on a simple errand to get some salted fish and native chalk to satisfy the cravings of her pregnant sister. Along the way, she gets pulled off track and shoved into a cavernous world where ancient secrets and human sacrifices are being used to hide something very sinister. To find her way out of the dark world, she must solve the mysteries which reach far beyond her understanding and walk the tightrope between love and power as ancient Africa rises up to test her fortitude and her loyalties. The cost of failure is beyond what she is willing to pay; her life. The deep mysterious intrigue of“Mysterious Depths by Mimizz Efemena Agvarota is a thrilling journey of suspense that will keep the reader on the edge of their seat. The reader will feel like they are actually looking into the captivating eyes of Prince Uwami as they embark on this path along with Mamuke. With each piece of the puzzle that Mamuke puts in place, the mystery deepens and the danger increases. Suspenseful, adventurous and captivating, Mysterious Depths takes you on a mystical journey that will make you understand why they call Africa the Dark Continent.